’s old website, while housing tons of great information, was difficult to keep updated or navigate, and really didn't properly convey the fun, happy and loving feeling you get as soon as you arrive on campus. 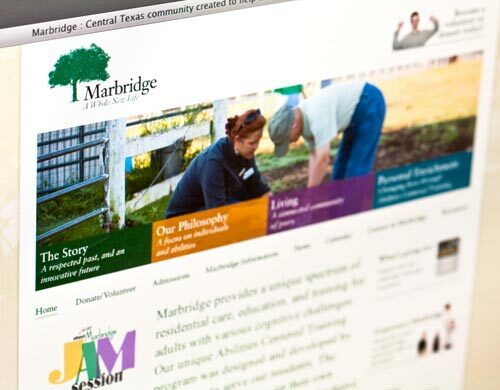 In conjunction with a large capital campaign to help fund substantial renovations to prepare Marbridge for a long and successful future, they wanted a new website to reflect not only the forthcoming physical changes, but also to convey the feeling you get when you visit in person. I poured over their existing photo library, coordinated multiple photo shoots and wrapped the result in a restructured, editorial-style layout to demonstrate that there is always something fun happening at Marbridge, whether it be learning or playing sports. As an added bonus I was able to art direct myself in order to flesh out the new photography library and it couldn't have been a better experience.